2000 saw some great new features. Firstly, from now on, each edition would have a motto, a key word, theme or special dedication. It began with ‘Living is an Art’ and it was a great journey. The start was moved to La Villa and the Fedaia Pass was no longer part of the route. The committee established a fixed number of 6000 participants. Over 30 nationalities took part. However, the edition was marked by a terrible accident: a competitor died while coming down the Giau Pass. "The magic lives in us!" The theme for 2001 was ‘Magic Lives in Us‘. The fixed number of participants was raised to 7000. The 2002 edition was dedicated to women and was broadcast live for the first time on RAI3. It was an unexpected success: millions of people discovered the wonders of the route wedged between the Dolomites. 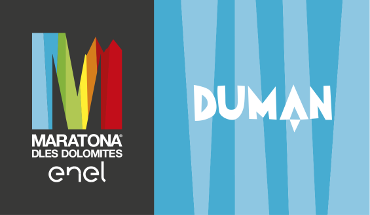 All future editions of the Maratona dles Dolomites would be broadcast live on T.V. In 2003 the Maratona was dedicated to the differently-abled and was twinned with the New York Marathon. Organisers decided to introduce anti-doping tests. The family was the focus of the 2004 edition. All three routes were closed to traffic for the first time. The Maratona without cars was amazing. The maximum number of participants was increased to 8000 and registration ended in one week.